Pascal Krieger was born on 9 April 1945 in La Tour-de-Peilz, Switzerland. After 5 years spent in a seminary to become a White Father, he undertakes an apprenticeship as typographer in Montreux as from 1960. In 1963 (October), he enters the Montreux Judo Club and starts training in Judo. In 1966, he moves to Geneva and enters the Shung Dô Kwan, one of the outstanding martial arts club of the city. He obtains his 1st degree black belt in Judo just before leaving, by boat, for Japan. He stays there during two years during which he meets Donn F. Draeger Sensei who introduces him to Shimizu Takaji Sensei, Headmaster of Shintô Musô Ryû, in March 1969, as well as to Kuroda Ichitarô Sensei at the same period. As from that time, Pascal Krieger trains in Judo at the Kôdôkan, in Jôdô at the Rembukan with Shimizu Sensei, and in Iaidô and Shodô (calligraphy) in Ôji with Kuroda Sensei. In order to survive, Pascal teaches French and English a few hours a day. In 1971, his father being seriously ill, Pascal returns home just in time to see him die. He stays in Geneva for 8 months during which he introduces Jôdô and Iaidô to some of the Shung Dô Kwan members. In September of the same year, Draeger Sensei requests him to go to Chicago, USA, to take the direction of the production of a Judô magazine Judo Illustrated in which he writes very appreciated Budô articles. It is a rather uncommon professional experience. Pascal follows all the national Judo championships, camera in one hand and pen in the other in order to write articles which he gets edited by a native speaker editor. Then he does the composition on an early IBM typewriter, lays out the material and even prints the magazine on a brand new ABDick. At the same time he practises Judô at the Uptown Dôjô. For Jô practice, he goes down the State of Illinois to Peoria to train with Relnick Sensei who is working in this city. For Iaidô practice, he trains alone in a courtyard. At the end of 1972, Draeger Sensei requests Pascal to go to Hong Kong to produce a new magazine, on global martial arts, this time, Martial Arts International. Quintin T. Chambers Sensei is the editor, but most of the material (thousands of typewritten pages and thousands of slides taken during his hoplological trips in South-East Asia) belongs to Draeger Sensei. In Hong Kong, Pascal prepares himself for a long stay but, at the end of 1972, the Oil Shock drowns the project and only the three first issues are printed (with three other issues laid out that never made it to the printshop. During his stay in Hong Kong, Pascal trains Judô with a Japanese wrestler, friend of Draeger Sensei, on King Edward Road. 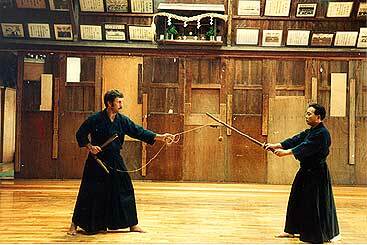 He also teaches Jô to Stephen Hua, a former disciple of Donn Draeger and Taichi teacher. Training Kenjutsu with headmaster Shinizu Sensei at the Rembukan in 1969. Thus, at the end of 1972, Pascal Krieger returns to Japan and starts again the practice of his four disciplines. During these four more years, he works closely with Donn Draeger Sensei in illustrating and laying out his numerous books. During this second stay in Japan, Pascal is promoted Nidan and Sandan in Judô, Oku-iri and Yodan in Jô (Nidan in the Kendo Renmei for Seiteigata) and Sandan in Iaidô and Shodô. Concerning Jôdô, Pascal trains very regularly with Shimizu Sensei’s top students, Kaminoda Sensei, Hiroi Sensei, Yoneno Sensei and Nishioka Sensei. He also often practises with his Sempai, Mr. Osato, Mr. Furukawa, Mr. Kobayashi and Mr. Matsumura to list a few. 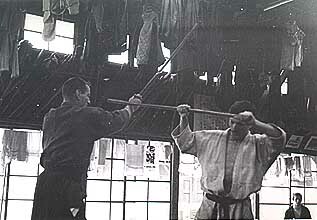 Pascal Krieger training with Draeger Sensei (left) at the Tomisaka Dojo in 1969. Being saturated by 6 to 7 hours of daily practice plus trains, subway and bus trips, Pascal decides to return to his country. Time had come to pass further. He leaves Japan in Summer 1976 via Malaysia where he follows Draeger Sensei in his annual trip across the country (Johore, Seremban, Ipoh, Penang) assisting him in teaching with Karuna Sensei, being closely watched (and corrected) by Draeger Sensei in his attitude while teaching. 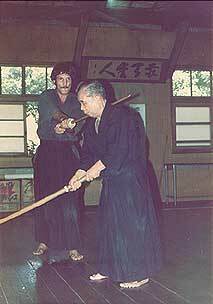 Training kusarigama in Dai-4 kidôtai in Yotsuya with Kaminoda Sensei in 1985. In August 1976, Pascal Krieger establishes himself in Geneva again and joins the Shung Dô Kwan with which he had kept a close relationship. Soon afterwards, he starts teaching regularly Judô, Jôdô, Iaidô and Shodô. His groups of Jôdô and Iaidô function rather well, and Pascal founds, in 1979, the Helvetic Jôdô Association (AHJ). A few years later, he creates the European Jôdô Federation. Since his return from Japan, Pascal keeps strong ties with Draeger Sensei (deceased in 1982), Shimizu Takaji Sensei (deceased in 1978), Kuroda Sensei (deceased on 16 January 2000) and Kaminoda Tsunemori Sensei. Pascal returns 6 times to Japan between 1976 and 1997. In 1985, he completes his study of Shintô Musô Ryû by learning Kusarigamajutsu with Kaminoda Sensei at the Yotsuya Kidôtai. Soon afterwards, he receives his Shomokuroku from Kaminoda Sensei with Shimizu Sensei’s stamp on it. In Switzerland, he is promoted Yodan in Judô by Mikami Sensei and Kondo Sensei. He pursues his studies of calligraphy by sending his monthly homework to Kuroda Sensei and is promoted to 10th dan in this discipline in 1996 and to Jun-Shihan in 2003. He is finally promoted Shihan in this art in December 2005. Selon la tradition, Pascal peint le deuxième oeil du Daruma après 4 ans de travail parallèlement à son activité professionnelle à plein temps et ses nombreuses heures d'entraînement. Le premier oeil avait été peint en 1985 et avait surveillé Pascal de son regard borgne pendant 4 ans. Despite that, and above all since Draeger Sensei’s demise, Pascal Krieger feels alone in the world of Jôdô. Many questions remain unanswered, and, far from any teacher, he’s afraid his teaching starts to slide away from the original one. As there is not a single book on Jôdô apart from two books in Japanese, Pascal decides to write a bilingual book on Jô to consolidate his knowledge of this tradition (English and French, 500 pages, 2000 photographs and 2000 drawings, the book covers the kihon and the first three series in Jô, Omote, Chûdan and Ran-ai. A historical and philosophical chapter preceeds the technical part. (Unhappily, this book is out of print since January 2004 and Pascal does not intend to publish another one until is is retreated - 2010). Having written down his doubts and questions, Pascal is now eager to get the answers. They are waiting for him in the Hawaii 1994 International Seminar. Nishioka Tsuneo Sensei is participating in this seminar as Technical Advisor. It was a real mind-opener. The long-awaited answers become quite obvious. The frustration of not having thought of them himself is largely compensated by the enthusiastic adhesion of the majority of his students to this style, more classical but more realistic, in which the sword part refinds all its meaning. From then on, Pascal invites him to Europe every year tightening a mutual relationship of friendship and respect. Nishioka Sensei promotes Pascal to Gomokuroku in 1994, in Hawaii and accepts him as personal student. 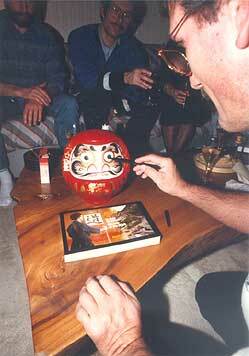 In 1998, Pascal receives his Menkyo Kaiden from Nishioka Sensei’s hands in Geneva. Pascal is Nishioka Sensei’s tenth and last Menkyo Kaiden. 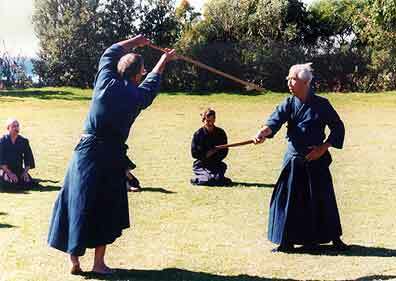 Performing Kodachi no Ran-Ai with Nishioka Sensei in Sydney, Australias, in 1997. Pascal Krieger participates actively in the teaching at all the IJF international seminars: Malaysia, 1979, 1982, 1985, 1991, Switzerland, 1988, Hawaii, 1994, Sydney, 1997, Colombus, Ohio, 2000, Vesc, France in 2003, Brazil in 2006, Matsumoto in 2009 and Broc, Switzerland in 2012, Penang/Malaysia in 2015. He is President of the International Jôdô Federation (IJF) since July 2000. On the 11th of June 2008, Pascal was awarded the "Order of the Rising Sun, Gold and Silver Rays". He wants to share this honor with all his teachers, students and friends. pictures from the ceremony; speech of acceptance. Because of the numerous queries to which no answers were given due to the fact that the book is out of print since 2002, a Web specialist has scanned all the pages of the book. Pascal Krieger has not asked for this website. He asks everyone reading this to be well aware that the techniques shown in the book should not be taken for granted. Jodo evolved quite a bit since 1994, the year Nishioka Sensei, an early student of Shimizu Sensei, became Technical Advisor of the IJF. This book is uniquely a reference.